Don W6JL’s 50 watt FET amplifier is a popular afterburner for FT817s and other QRP rigs and exciters. Don won the QST Homebrew contest in 2009 with this design. The amp offers a useful order of magnitude (12dB) power lift over QRP levels, and apart from the power FETs can be built from an averagely stocked junk box. The FETs are commonplace and cheap — they can be bought for as little as 98c each! After completing a 6-band SSB/CW QRP transceiver (Summit Prowler IV) I found myself thinking about a more compact QRP SSB/CW rig for SOTA, with two of the main day-time SOTA HF bands (40/20m). The design driver this time was to try a different ‘form factor’ — I wanted a rig with a narrow and long case, such that it would easily slide inside a backpack, and on a summit sit vertically against a rock or be hand held. All my SOTA rigs so far use both front and back panels for connections and controls, so they need to sit level on a horizontal surface. As most rocks or tree stumps are low, you can’t easily read the display. Some designers get around this by putting the display on the top of the box, a sensible adaptation but one that makes the rig look like a flounder. Because I spend a lot of time building and using these radios at home on the shack bench as well as on a summit, I wanted a design for use in both situations. Last year I cross country ski’d into Federation Range VK3/VN-029, 1490 meters above sea level, activated it for 8 points (+3 winter bonus points) and ski’d out again. This is possible because this summit is just off groomed cross country ski tracks at Lake Mountain, ninety minutes north east of Melbourne, a popular sight-seeing, tobogganing and cross country skiing spot. Time to do it again. 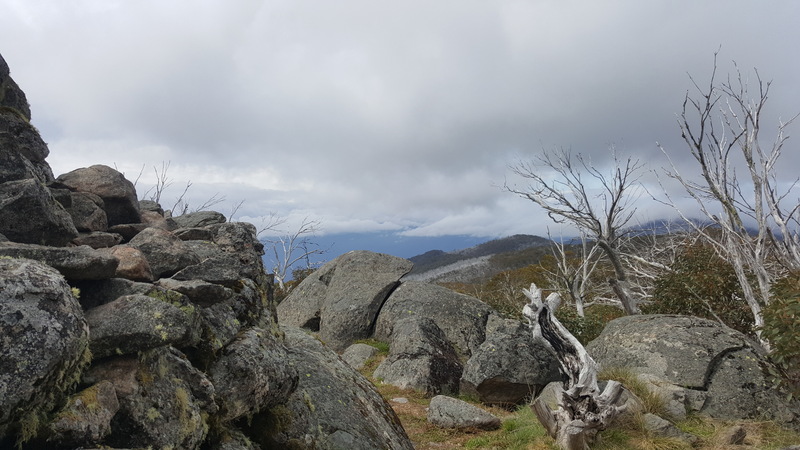 After picking up skis at Marysville I took Royston Trail from the car park up the long incline, to Panorama, then Hut Trail to Boundary Hut, the remains of a hiking hut, long since burned out, only the stone walls standing to waist height. Distance out is about 4km. 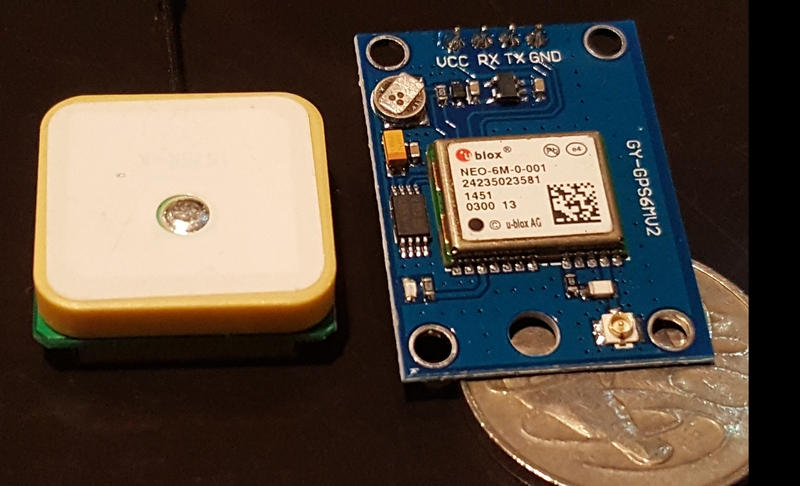 How could a GPS unit integrated with a SOTA transceiver assist in activations? I’ve been turning that thought over for a while now after seeing David VK5KK’s GPS and Arduino based grid square locator (posted to the ‘VK Homebrew’ group on facebook). The ready availability of cheap GPS units with a simple serial interface makes the option straight-forward. As my homebrew rigs are using Arduino Nanos and si5351 breakout boards, the GPS is just another (serial) attachment. ‘Summit Prowler IV’ is a scratch-built six-band SSB and CW transceiver, designed for portable and SOTA activations. It is based on Leon VK2DOB’s MST3 (Minimal Sideband Transceiver, third version) from 2016, with alterations to support multiple bands, my Arduino-based digital VFO/controller and keyer, and a few extras to support portable operating. The transceiver is a conventional single-conversion superhet with 12MHz IF and an si5351 and Arduino Nano-based digital VFO. This project comes after having done more than 50 activations with my 2013 MST Mk I kit radio on 40m SSB. This rig has performed well on 40m SSB (and CW after I added it) and has launched my interest in SOTA activating, turning me into an occasional weekend ‘summit prowler‘. VK3’s ARH, YY and PF on Mt Murray. On the weekend of the 3rd and 4th Feb 2018 I joined about 18 others at Brian VK3MCD’s now annual VK Mt Hotham SOTA weekend, starting with a night on Mt Buffalo camping at Lake Catani the night before, and with some activations at Falls Creek on Friday. With the summits at Mt Buffalo (The Horn, The Hump) and Falls Creek (Mt Nelse, Mt Cope), then 2 days four wheel driving, I accumulated 124 activator points. A productive long weekend! The Melbourne Cup, a hugely hyped horse race affords Melburnians with a three day long weekend, allowing yours truly, being disinterested in all things equestrian, a day in the Victorian mountains, my first activations for more than 3 months. Mt Torbreck VK3/VN-001 in the Rubicon Range just south of Eildon would start the day, followed by nearby Pyramid Hill and the peak in the Cathedral Ranges if time and energy allowed. Leaving Melbourne suburbs early, I turned the ignition key at 6:10am and drove towards Eildon, then south down Snobs Creek Rd to Conns Gap Rd, parking at Barnewall Plains Track by 0812, 2 hours and 2 minutes drive time. The temperature was 8.5C. The gate was open and a proper 4WD would have ploughed up the first steep section, but I happily walked the kilometer or so to the camping area then up the track to the summit. Steep, but with rewarding scenery, although the summit was in mist and just under cloud.